What is NOVAG? I belong to one of the oldest gaming groups on the East Coast, Northern VirginiA Gamers (NOVAG). We’re a largish gaming group that encompasses tabletop gaming, miniatures, card games and rpgs.. but mostly miniatures based games. NOVAG is a pretty mellow club. I’ve been a member since the 1990s and it seems devoid of the rifts and cliques that beset larger organizations with more money to spend. It’s Free! NOVAG used to collect dues and have a real, two day convention in a real hotel. Expenses grew to the point that we could no longer afford to hold cons in the DC area, no matter where. Costs and participation are now totally free, and we handle club management via the Internet, to general popular acclaim. It’s Punctual! 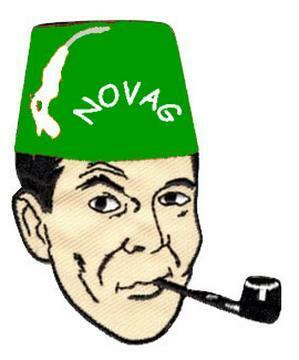 NOVAG used to meet every Friday night at the Game Parlor in Chantilly, VA, but that venerable location closed last year, forcing us into many smaller, geographically spread out locations. We also hold two annual game days. 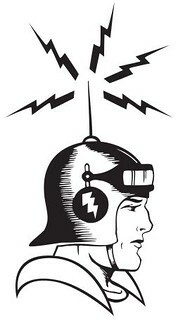 For details about NOVAG, visit the NOVAG website (which I started back in 2002 on another host!) or contact Tim Tilson by email (hmslydia@yahoo.com, I think). There is a “Thursday Night Group” at the Game Parlor that loosely affiliates with NOVAG, see “Conventions” below. Why the Fez? Our official logo is a doozy.. with cannons over the State of Virginia, and all that. Our UN-official logo is something I’m happy to have been part of. I took a hip piece of clip art, colored it in and added some letters, and voila! Lounge Larry (above) was born as our “less than serious” logo. 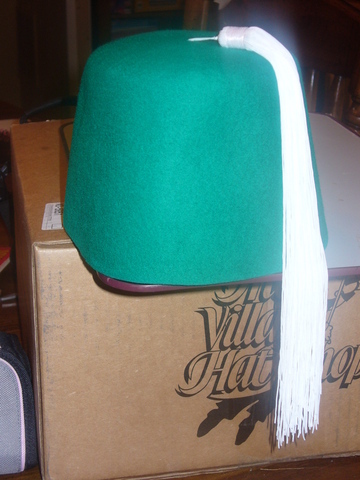 As a byproduct of the unofficial logo, the Green Fez was adopted as our “official headgear” sometime around 2002. Reading: We have an EZine which is edited by Mr. David Luff, and it comes out about 2-3 times a year. Conventions: NOVAG is ably represented at GENCON by Mr. Stephen Gibson and his large coterie of pals and relatives, running an awesome array of miniature wargames. For more information, visit his website. NOVAG Gamemasters also respresent the club at regional miniatures conventins such as COLD WARS, HISTORICON and FALL-IN!